Every year, nearly three million children visit the emergency room for help with a sports-related injury, and another five million see a primary care physician or sports medicine professional. Playing sports teaches kids all kinds of lessons, that they shouldn’t be avoided just because of the risk of injury. Instead, it’s important to know how to prevent sports injuries so that you can help your child avoid being one of the millions who gets hurt every year. And, in the event that they do get hurt, you should also know the signs of common injuries so you can get them help as soon as possible. Listed below are three of the most common sports injuries that send young athletes to the doctor each year. When the arm is held straight to the side and forced backward, a shoulder dislocation can occur. Young athletes are especially prone to shoulder dislocations because their joints are naturally looser. To treat a shoulder dislocation, a doctor, EMT, or another medical professional will need to reduce it or put it back in place. This can be quite painful, but it’s necessary to restore mobility and prevent more serious issues. While you’re waiting for medical treatment, it’s important to use a sling or splint to hold the joint in place. Apply ice, too, to help minimize pain and swelling. Young athletes can prevent shoulder dislocation by taking care to avoid falls and wearing protective gear when playing contact sports like football. The meniscus is a piece of cartilage shaped like the letter “C.” It absorbs shock and helps protect the knee from injury. Meniscus tears most often occur when the knee twists unnaturally — they’re common in basketball, soccer, and tennis players. Meniscus tears don’t always require medical intervention. Sometimes, especially in young athletes, they can simply be treated with rest and ice. Athletes can also wear knee braces to provide support and prevent future injuries. When a meniscus tear happens, athletes typically hear or feel a pop and will experience pain in the knee. Other symptoms that accompany meniscus tears include swelling, stiffness, difficulty straightening the knee, and feeling as if the knee is locked in place. You may need to take your child to see a doctor If the pain doesn’t get better with ice and rest. They may also need to see a doctor if the swelling doesn’t go down or if mobility doesn’t improve. Meniscus tears can be avoided by strengthening the muscles around the knee, including the calves and quadriceps. Wearing proper shoes, warming up properly before games and practices, and learning proper technique for jumping and pivoting movements, is also helpful. Many parents are worried about their child playing football because they fear concussions. Concussions can occur in football, they can also occur in any other contact sport, including soccer, hockey, wrestling, or rugby. Concussions are most often treated with rest, minimal electronic use, and a complete break from physical activity. 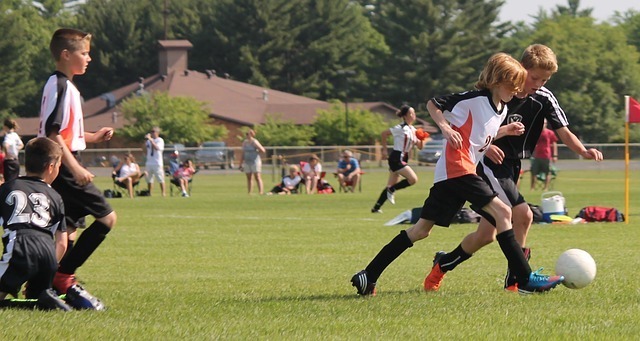 Young athletes are more susceptible to concussions than their older counterparts, and they typically need longer rest periods to allow their brain to heal. Coaches should also know how to recognize concussion symptoms and take athletes who are showing these symptoms out of the game immediately. As a parent, it’s tempting to keep your child out of any activity that could potentially cause them harm. Rather than trying to completely shield them from injury, though, it’s better to know how to treat injuries while also teaching your kids how to avoid getting hurt while still doing the things they love.